Two months ago, the Journaling Bible that I had always wanted arrived in the mail. It was always out of stock so when a few stocks were available again for order, I quickly secured a copy. It's truly beautiful, just like a giant, divine Moleskine notebook. I was almost scared to write on it! I don’t personally know anyone who documents their faith on a Bible journal & had never seen anyone work on it in person, except for some videos I saw. So I decided, that I’ll just apply my personal art journaling style and just wing it. 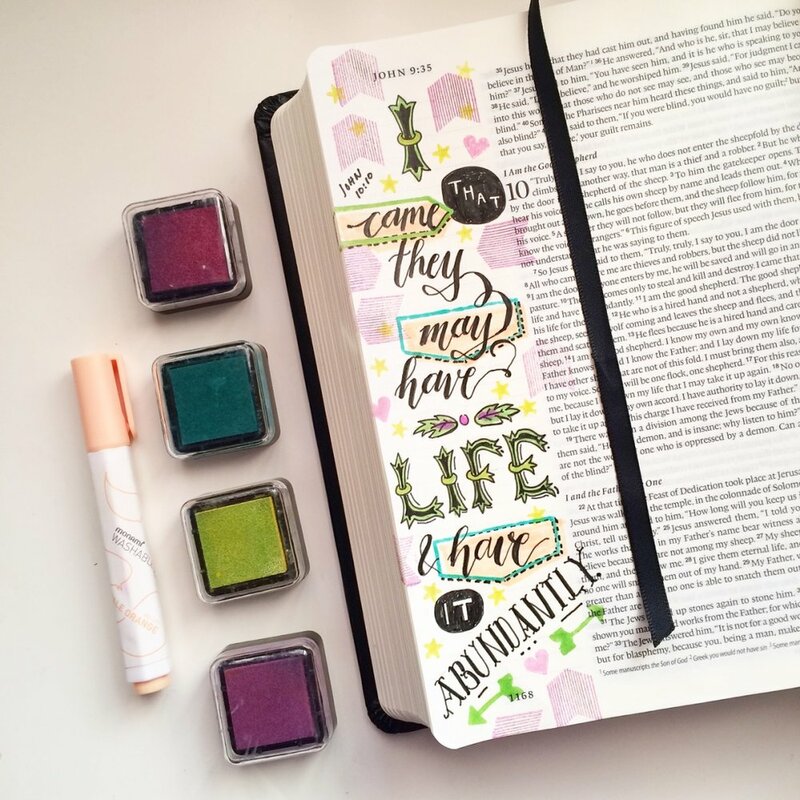 Here are some images of my Bible journaling pages. I hope this inspires you to document your faith in a creative way, especially newbies. I used very basic materials only. I have not purchased any kit designed for Bible journaling yet as I am only getting started myself. A Bible journal has a lined column for journaling. The lines very are faint, almost did not show on my images here. I use them as guides for my hand lettering. Here’s my first try using a verse given by a friend on my birthday. I used gel pens and some stickers by Paper Stone. My second page is memorable. It was featured on Illustrated Faith’s Instagram account a few minutes after I posted it. I thought I must have been doing something right! This was done using Zig CocoIro & Fudebiyori pens. The adorable bee & butterfly drawings were added by my daughter. The verse is from a recent Bible study with a good friend. 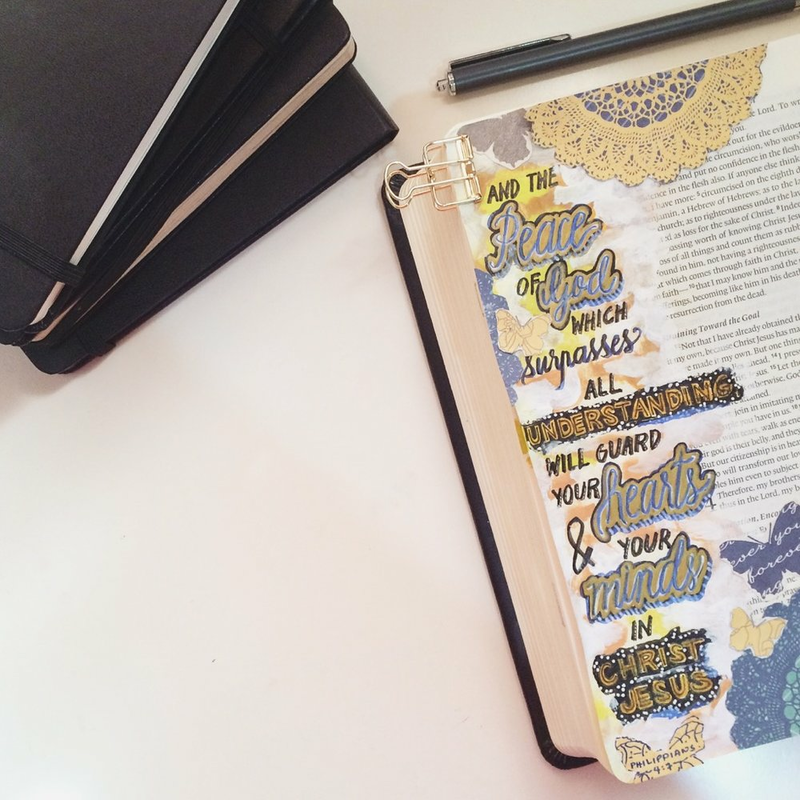 I was actually inspired to do Bible journaling because of our weekly coffee + spiritual meetings. My 3rd page was (I can’t believe it!) featured again by Illustrated Faith. My handlettering here was inspired by the courses I took from The Postman’s Knock. This time I incorporated stamping. Here’s a page where I tried adding a different material: glitter stickers! Love this fun page! My husband was able to open my jar of gesso just in time for this page! I used it with a punched paper (a die cut negative page) to serve as a mask to make the circle grids. I then added puffy & felt stickers to add interest. As you can see, all the pages I made so far were true to the column. I really like the clean look of a single column art. My other purpose for this was that I still like to be able to read the text of the Bible clearly even if there’s art beside it. But for this next page, I tried going outside the column and even tried using layers of acrylic paint so the overall look is similar to my mixed media pages. This has it’s own charm but I was still uncomfortable to see that I covered the verses' text. I have yet to discover if I’ll do this kind of “going out of the column” style again. I wish this post sparked some ideas! Remember, you don’t need a Bible journal to get started with documenting your faith. You can start with a simple notebook. If you are a creative and you feel the need to make art that aligns with your faith, I hope you give this a try.